As we celebrate the rich legacy of photography at Taliesin West through the lens of Pedro E. Guerrero, Wright’s winter home will be your backdrop for a weekend photographic journey. Local Arizona photographer Andrew Pielage will guide you in capturing the surrounding Sonoran Desert and National Historic Landmark. Learn the tools needed to best utilize a camera including aperture, shutter speed, and ISO while applying creative approaches to composition, image framing, and the challenges of light and shadow, including capturing sunrise and sunset. Requirements: Students must provide your own fully manual camera and tripod. Registration will close at 8 a.m. the Thursday prior to the workshop date. The workshop is subject to cancellation if minimum enrollment has not been met. Session fees cover all materials and include a $50 non-refundable registration charge. You will receive an optional our of the historic home. 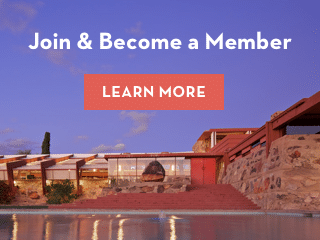 Frank Lloyd Wright Foundation members receive a 10% discount on the workshop. Breakfast on Saturday and Sunday, and lunch on Saturday is provided. Must be 18+. Participants have the option of staying the nights of October 26 and 27 at Taliesin West. Click here to register with lodging. Saturday, October 27th — 8 a.m. – 7 p.m.
Sunday, October 28th — 6:30 a.m. – 1 p.m.